A highly-specialized journal, it is supported by in-kind work and contributions from an international Editorial Board, and published by Massey University, New Zealand. The journal’s online format provides a relatively cost-effective and timely forum for research, reviews, and commentaries for search and rescue practitioners. Another benefit of the online environment is that the journal has Facebook and LinkedIn pages to connect with and engage its readers with the publication and with one another. 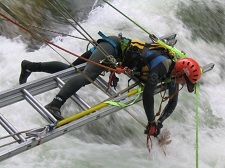 The inaugural issue included the articles “Auditory and Light Based Two-Way Effective Sweep Width for Responsive Search Subjects in New Zealand Mountainous Terrain” [a report of an experiment to assess the effectiveness of a search team or use of Probability of Detection (POD) using whistle blasts and lights at night] and “Time Required For a Drowning Victim to Reach Bottom” (which describes a mathematical model to determine location of a drowning victim from surface to bottom, including a table for drift during descent). This research illustrates “the need for immediate search and rescue from the bottom starting at the last point the victim was seen” and where to start searching. While topics here are very specialized, articles are written in such a way as to be accessible to interested lay readers interested in search and rescue. Recommended for special and academic libraries supporting search and rescue programs and operations.